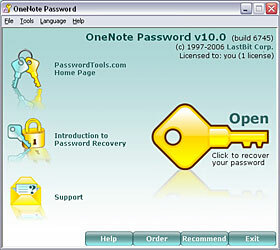 OneNote Password is a password recovery tool, which comes in very handy if you forgot, lost, or misplaced your password for OneNote notebooks (*.one files). Such a situation might occur if someone who does not work with you anymore password protected some vital information that is absolutely necessary to retrieve. 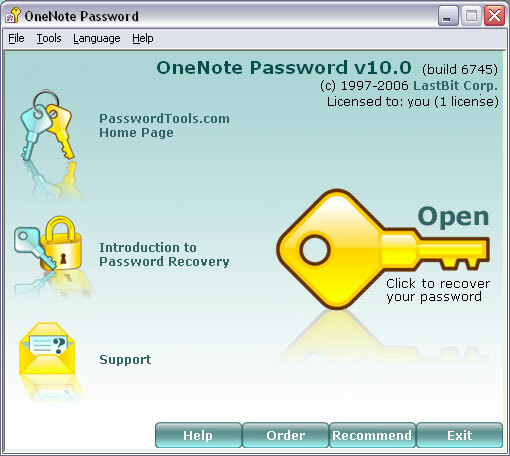 OneNote password protection is based on strong crypto algorithms, so password recovery is a complex task. OneNote Password supports brute-force attack, dictionary attack, hybrid dictionary attack and SmartForce(TM) attack. If your password is really long and complex, you have poor chances to recover it (competing recovery tools will fail as well). You can find more information on password protection here.